Launched in collaboration with Titan Airways, the First Officer Programme has been developed to offer an industry-leading opportunity for low-hours cadet pilots. This is a bonded cadet recruitment programme, where the cost of the Type Rating will be funded by Titan Airways. The programme is open to pilots who hold a CPL ME/IR - including those who have not yet completed an MCC course. Candidates who pass the rigorous multi-stage selection process will then spend a month with VA, undergoing enhanced AirlineReady® multi-crew training, with the security of having a conditional job offer from Titan Airways before starting. What's different about the Titan Airways First Officer Programme? The recent industry norm has required aspiring airline pilots to take a significant risk and commit to a large upfront financial investment, long before being able to apply for an airline job. The First Officer Programme is designed to break away from this norm, towards a new concept where the airline and ATO are partnering to make an airline pilot career more accessible for those with genuine ability - not just an ability to pay. The stand-out feature of this programme is that it offers an opportunity for pilots of the highest calibre to secure a conditional job offer from the airline at a much earlier stage in their training. Remember, the programme is open to pilots who have not yet completed an MCC course. How does the Titan Airways First Officer Programme work? After your application is received, you may be asked to complete an online personality questionnaire before it is decided whether you will be invited to take part in the selection process. There are two stages in the selection process, and you must pass the first stage in order to progress to the next stage. Selection day consisting of an initial interview followed by a simulator assessment. There will be several selection days between mid-September and mid-October. Recruitment day at Titan HQ consisting of group exercises and a final interview. There will be two selection days around mid-October. This final stage of the selection process is to assess your specific suitability for a role with Titan Airways. Candidates who pass both stages of the selection process will receive a job offer Titan Airways, which is subject to the subsequent training being completed to the required standard. With the security of a job offer, Titan Cadets will first undertake a specially extended version of VA's AirlineReady® course. Titan Airways will have full visibility of your training records throughout your MCC training. Titan Airways staff may also oversee many of the simulator training sessions, and will be involved in the Skills Test and final evaluation. Providing you pass the Skills Test final evaluation, you will progress to Phase 3 and will be offered salaried employment by Titan Airways before commencing airline-funded Type Rating training. 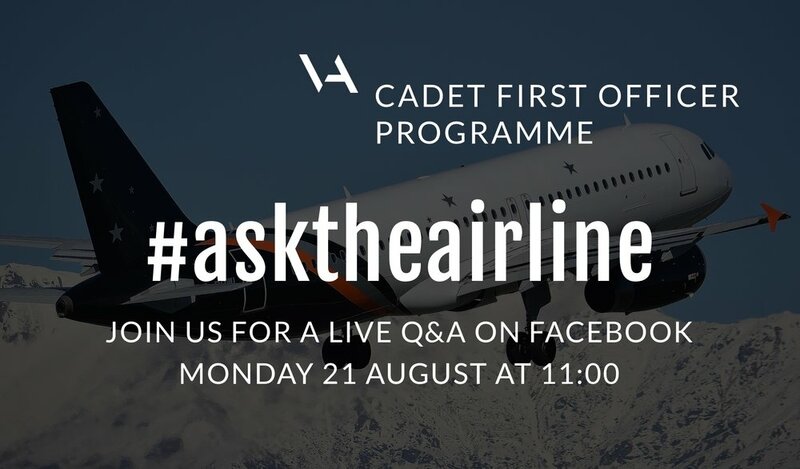 This programme is designed to minimise personal risk by offering an opportunity for the highest-calibre cadets to secure airline employment at an earlier stage of training, before investing in MCC training. Pilots who have completed an MCC course previously are welcome to apply, but will still need to complete Phase 2. That's because overseeing your progress through Phase 2 is important in order for Titan Airways to verify your suitability for an airline-funded Type Rating. If you complete the course but do not pass the Skills Test and final evaluation, you will not progress to Phase 3, but you will still receive a course completion certificate, allowing you to apply to other airlines. Candidates who pass the Phase 2 final evaluation will be offered salaried employment with Titan Airways as a Cadet First Officer. Your employment with Titan Airways will start with a company induction at Titan Airways HQ at Stansted Airport in early 2018. The choice of aircraft type will be determined by Titan Airways, depending on their operational needs. Subject to the successful completion of Type Rating and Base Training, you can expect to join the fleet in March/April 2018. You will be a salaried employee of Titan Airways from the time you attend the company induction at Stansted in early 2018, prior to the start of Type Rating training. The cost of the Type Rating and Base Training will be paid by Titan Airways. In return, you will be bonded to Titan Airways for a three-year period. Phase 1: Selection costs are £200 plus VAT for Stage 1, and no cost for Stage 2. Phase 2: The cost of the extended MCC training is to be paid by the cadet prior to training commencing. Phase 3: The cost of the Type Rating and Base Training will be paid in full by Titan Airways, covered by a three-year bond. Titan Cadets will become salaried employees at the time of starting the company induction, prior to commencing Type Rating training. Titan Cadets will be responsible for their own accommodation, transportation and living expenses during selection and training. Sorry, the application window for this intake is now closed.